A wide range of devices for almost every application. 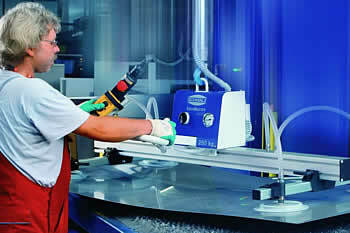 The lifting system VacuMaster Horizontal is suitable for many vacuum handling applications. Typical workpieces handled with these devices includes lifting sheetmetal, lifting laminated board, lifting plastic sheets, drums, lifting benchtops and more. Workpieces can range in shape and size, with weights of up to 750kg and sheet sizes up to 4000mm x 2000mm possible.